When to attempting to protect properties from Power Tools, there must first be an understanding of what power tools are. Power Tools encompasses everything from battery powered hand drills to petrol powered specialist cutting equipment. With Bodily Force on the other hand, this general refers to any tools that are manually operated. Essentially, any attack intended on a property with mechanically enhanced tools that drill, cut, grind or fire is regarded as a Power Tool attack. Due to the effort needed to acquire power tools (not to mention the skill required to use them) attacks of this kind are understood to be premeditated and malicious. The property and contents within must be of a high enough value to the intruder to risk the attack in first place, let alone use tools that are dangerous enough to cause serious damage if mishandled. The target is often the assets within rather than to cause damage to the property itself, though application type is a large consideration when implementing the security measures. This distinction suggests that properties with theft or espionage as their most significant threat are unlikely to be targeted by terrorist attack. Crime and prison statistics show that over 70% of inmates within UK prisons are reoffenders. The likelihood of a premeditated, targeted attack of such severity being successfully committed by an inexperienced criminal is small. Professional criminals will not only expect the standard security protocols in place, they will know how to avoid them. Why is it important to protect against a power tool attack? Visible security measures play a large part in the deterrence of criminal activity. However, for the determined intruder who has the skills to surpass basic security, there is nothing that is 100% guaranteed to stop them. Despite this, there are still numerous measures that can be implemented within the security procedures to delay the attack. Power tools are determined at a LPS 1175: Issue 7 Tool Category C standard according to the Loss Prevention Certification Boards (LPCB). Category C requires minimum SR3 certified measures. With the broadest scope of tool categorisation, the LPCB LPS 1175: Issue 7 certification provides an industry-wide recognition for products that have achieved performance standards. By acknowledging that the determined criminal won’t be discouraged by basic measures, referring to CCTV cameras or basic security grilles, independently certified products that can resist attack (or at the very least delay) by power tools are vital. For properties and buildings more likely to experience attacks by power tools, a Architect Liaison Officer (ALO) or independent Security Consultant may be appointed to recommend the best course of action. In these cases, the ALO will specify products best suited for the application and risk profile. The national police crime prevention initiative Secured By Design (SBD) was established to promote intelligent architectural design as the most successful strategy to effectively secure a property. The SBD recommends products and measure that have achieved certification through the LPCB, from which Security Consultants and ALOs may refer to. Though the main target for Power Tools attack is assets (valuable goods), there is high risk of bodily harm should the intruder be interrupted. Experienced as they are, the attack will be prolonged with little regard for noise. The intruder will make an educated guess in regards to layout and physical security measures in place from intel gathered or blueprints stolen; delaying access is of utmost importance. Integration with building management system (BMS) is key; automated detection alarms will be implemented to notify local authorities of intruders. The few minutes of delayed entry are precious to the capture and arrest of the intruder, especially those who are dangerous enough to attempt a break-in with a power tool. For a security measure to protect against tools such as disc grinder or circular saw, specialist materials will be required to be used to combat the mechanically enhanced attack. For such sophisticated product, standard products will be unable to withstand the force. Charter Global’s range of Security Shutters are a good example here. 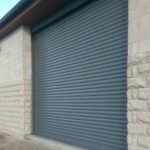 Standard shutter curtains and lath profiles are designed to act as more of a deterrence rather than a defensive measure, whereas Obexion Shutters can feature further reinforcement for the specific mitigation of a power tool attack. When specifying physical security solutions for a project that will encounter fierce attack, a strong first line of defence is vital. Protecting people is of utmost importance for any property, but when the threat is identified to be theft or espionage rather than intrusion with the intention of bodily harm, the property itself must be considered a higher priority. Sites and facilities that are mainly run via remote control stations (i.e. hydroelectric power plants in the Energy sector) without much of a personnel presence on site will relate in this situation. Here, the people element of security the site is somewhat irrelevant and resources may be best allocated elsewhere.